Bee Organika’s Forest Honey is also known as Honeydew Honey. Instead of gathering nectar from flowers, when making forest honey, bees collect honeydew from trees. It was once believed that the honeydew fell from the stars. More recently, people thought that the tree excreted it. In actuality, honeydew is excreted by aphids. Aphids eat tree sap, looking for amino acids. Once they’ve got what they need, they secrete what’s leftover back onto the tree. That sugary secretion is called honeydew. Wonderfully, much of this region also has large areas of land that are remote, cut off from civilization and sparsely populated. Producing honey that is truly organic becomes a feasible option in this sort of place. For one, forest honey is less vulnerable to crystallization than regular honey. This is because it has lower glucose levels and a higher mineral content. Bee Organika’s Forest Honey also tends to be darker in color and it isn’t as sweet as flower honey. Flower honeys have such mild flavors that they are easy to substitute for other sweeteners in coffee, tea or virtually any recipe or dish. 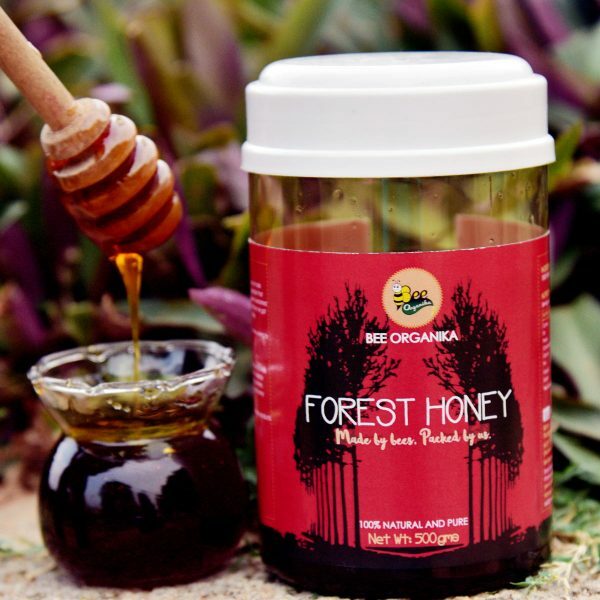 Forest honeys tend to have stronger, bolder, more distinctive flavors. You may still love them spread on toast, but you may find that they conflict with the other flavors in some of your recipes. Forest honeys are often prized by chefs because of how beautifully they pair with certain foods, especially meats and cheeses. All you have to do is drink or consume it regularly to get the maximum result. Usage of Honey : You can replace Honey with sugar. You can also use it with breakfast , cerelac , milk drinks. You may still love them spread on toast, but you may find that they conflict with the other flavors in some of your recipes. Forest honeys are often prized by chefs because of how beautifully they pair with certain foods, especially meats and cheeses. Forest Honey, in general, has a number of medicinal uses. It’s a natural source of energy and it helps to strengthen and support your immune system. 2. 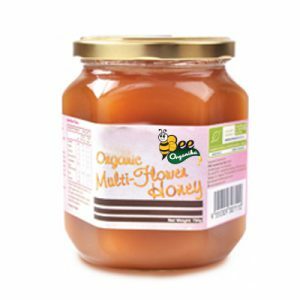 It contains high level of Vitamin C .
Bee Organika’s Stingless Honey ( Cheruthen or small honey ) is a natural product produced by both honey bees and stingless bees ( Meliponini Trigona ). Both types of honey contain unique and distinct types of phenolic and flavonoid compounds of variable biological and clinical importance. Honey is one of the most effective natural products used for wound healing. Stingless bee honey is twice as nutritious as ordinary honey, according to the reserch organisations . Stingless bee honey is called Mother Medicine and there are an increasing number of traditional practitioners and researchers suggesting its use. Health benefits of eating stingless bee honey regularly include anti-ageing, enhanced libido and immune system, fighting bacteria and treating bronchial catarrh, sore throat, coughs and colds. Propolis is considered beneficial to heatlh because it contains all 16 amino acids, glucose, vitamins A, B, C, D and E, bioflavonoids and minerals. Bioflavanid repairs and improves the systems of the human body and livestock. Bee Organika’s Cliff Honey is one of the most incredibly versatile products of mother nature has offered also called as Hill honey or Mountain Honey. When we think of cliff honey, its amazing medical benefits come to mind immediately. We sell the original cliff honey, extracted by tribes of India. We also provide our customers with the authentic experience of Indian cliff honey. This goes to show that we are dedicated to keeping tradition alive while supplying the best product on the market. Gathering honey from wild bee colonies is usually done by subduing the bees with smoke and breaking open the tree or rocks where the colony is located, often resulting in the physical destruction of the colony. We collect honey from majorly from Himalayan forest and south Indian forest like Wayanad , Coorge , Jawad forest , Sabaimala , western ghats. Bee Organika’s Raw Honey is the most original sweet liquid that honeybees produce from the concentrated nectar of flowers. 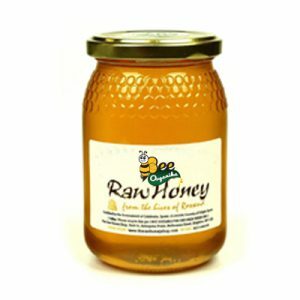 Real raw honey comes straight from the beehive and is a potent superfood sweetener gathered by one of the most profound creatures on planet earth, the honeybee. Bee pollen is considered to be one of nature’s best and most nourishing foods. It’s packed with protein that is combined with amino acids, that can be easily used by your body. Bee pollen is used to improve unbalanced nutrition, vitality, longevity, energy. But also, it is used for weight control, health, beauty, allergies, anti-aging and more. All of these qualities are lost with the removal of bee pollen. Regular honey does not contain bee pollen. 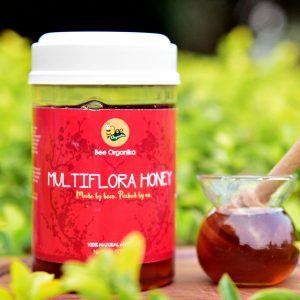 Bee Organika’s Multiflora Honey is truly a remarkable substance, made even more extraordinary by the process with which it is made. The Bees collected a bit of a mixture of nectar from Honey of thousand flowers . This honey is light in colour and has a sweet taste. Because it is composed of nectars from flowers blossoming at a particular period of time in a particular place, it is essentially impossible to reproduce it exactly from year to year. This blend of enzymes, minerals, vitamins, and amino acids is quite unlike any other sweetener on the planet. Honey is a great substitute for sugar which helps in managing calorie better while also adding many healthy nutrients in place of empty calories. We collect multiflora Honey from Organic flower farms .